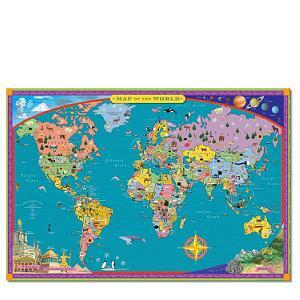  The Eeboo world map is a beautiful children's map.  Jumbo size and durable. 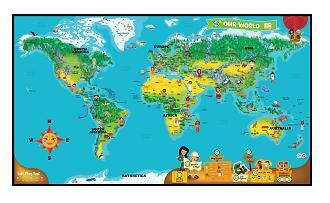 The Eeboo World Map is a beautiful map designed for children. It is 35" wide by 25" high, therefore it is quite large. It is up-to-date and quite detailed (for example, it even shows small islands in the Pacific). The map is colorful, contains a legend and features various illustrations (like examples of cloud formations, wonders of the world and other educational illustrations). It is quite sturdy and laminated on both sides so that it can last for a long time. It also has grommets so that it can be easily hanged. By looking at the map, children learn the position of continents, countries and cities on a world map. They also become curious about the world and want to learn more about foreign cultures.